In the past decade, minimal invasive surgery has seen a strong development over more traditional surgical techniques. The main advantage of minimal invasive surgery is to avoid the traumatism linked to the opening of the patient's body. In the case of laparoscopy, a video camera and few surgical instruments are introduced inside the abdomen through small openings. This technique has the advantage of being less invasive and therefore of shortening the stay of the patient at the hospital. However, minimal invasive surgery requires specific training due to the difficulty of moving a three-dimensional tool by looking at a two-dimensional video image which creates a problem of hand/eye coordination. Furthermore, the gestual dexterity is strongly reduced due to the shape of surgical instruments. the planning of the resection of hepatic segments from the CT-scan images of a patient. 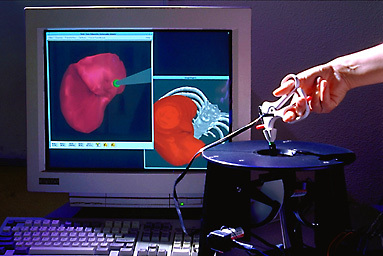 There are several advantages of a computer-aided simulator over current training techniques (mechanical simulator, training on cadavers or animals). Such a simulator would give an objective evaluation of a surgeon dexterity combined with a more intensive training activity. It would allow the simulation of rare pathological cases and could simulate the interaction with several organs. We have developed an hepatic surgery simulator that couples visual with force feedback. The force feedback allows the surgeon to feel the anatomical structures that it is interacting with. The geometric model of the liver is extracted from CT-scans of the abdomen acquired with contrast agent. An optimized method of deformation based on linear elasticity, provides real-time computation of the deformation as well as the associated reaction forces.